The ISPS-US Student & Early Career Committee (Marie C. Hansen, Terri Talley, Halle Thurnauer & Peter Pascatore) is pleased to announce the start of a new initiative– a virtual reading and study group. 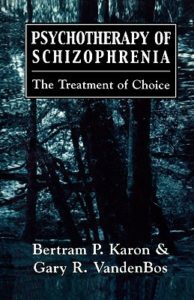 Our first reading will be Psychotherapy of Schizophrenia: The Treatment of Choice by Bertram Karon and Gary Vandenbos, a classic text on the psychodynamic treatment of psychosis. The reading group will be conducted through a closed Facebook group. You can access the group here. All ISPS members are welcome to join, with a special invitation to student and early career professionals. I’ve been meaning to get through this classic book: I think this group, with its timeline for discussion, will finally push me to do it!